Sudbury Neutrino Observatory (SNO) is an astronomical neutrino observatory the size of a 10-storey building, 2 kilometers underground, in the deepest section of the Creighton Mine near Sudbury, Ontari. ; SNO is an international collaboration of scientists from Canada, the United States, and the United Kingdom. 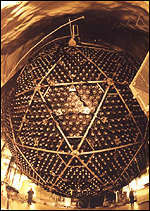 The SNO detector consists of 1,000 tons of ultrapure heavy water (water in which the hydrogen atom in the water molecule has an extra neutron), enclosed in a 12-meter-diameter acrylic-plastic vessel, which in turn is surrounded by ultrapure ordinary water in a giant 22-meter-diameter by 34-meter-high cavity. Outside the acrylic vessel is a 17-meter-diameter geodesic sphere containing 9,600 photomultiplier tubes, which detect tiny flashes of light emitted as neutrinos are stopped or scattered in the heavy water. At a detection rate of about one neutrino per hour, many days of operation are required to provide sufficient data for a complete analysis. Because SNO uses heavy water, it is able to detect not only electron-neutrinos through one type of reaction, but also all three known neutrino types through a different reaction.